Utilising the same full range coaxial driver used in our popular CFR12 wedge, the Q12a gives a wide 80 degrees dispersion pattern, with plenty of bottom end oomphf, usually only found in bigger cabs, all coupled with great power handling at 260 Watts RMS with a rating of 8 ohms. 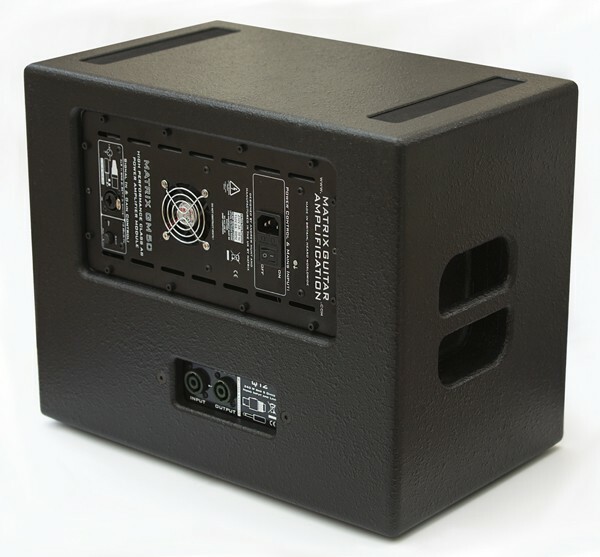 The power for the Q12a is provided by Matrix's highly respected GM50 mono-bloc module, already proven and used by professional cab builders and DIY buffs alike. Delivering plenty of high quality class A/B power with the same voicing as our flagship GT1000 amp ensures an uncoloured valve like feel with enough power to handle the loudest of on stage situations. When the GM50 module is switched off (and for safety we recommend unplugging the power cable as well) you are able to run the cab in passive mode from an external amp. The speaker link works as normal allowing the daisy chaining of cabs together. Back in active mode the speaker input must be disconnected and the speaker link allows power from the GM50 to drive the daisy chained cabs to a minimum 4 ohms load in total. For the Q12a input to the GM50 module is via a combi XLR 1/4 inch input. To give the module protection during transport we've recessed the GM50 into the cab ensuring no connectors or the volume pot can be easily damaged.